Thank you to Around the Rings for interviewing David Ulich, one of our executive board members, to learn more about our Athletes in Excellence program! Visit the Around the Rings website. It is always a joy to see our friends recognized for their great work by other organizations. We recently learned that our 2014 Humanitarian Award recipient, Professor Arne Ljungqvist, was awarded the “Illis Quorum” medal by the Swedish government. Arne Ljungqvist was born, raised, and still resides in Sweden. He represented Sweden at the 1952 Olympic Games at a high jump competitor, and he later attended medical school at the Karolinska Institute in Solna, Sweden. He is a Swede, through and through. Professor Arne Ljungqvist is also someone who cares deeply about the health and welfare of athletes, as well as the culture of sport itself. Throughout his career with the International Olympic Committee and the World Anti-Doping Agency, Professor Ljungqvist has always striven to keep sport clean and athletes healthy and free of harmful substances. Learn more about Professor Arne Ljungqvist. 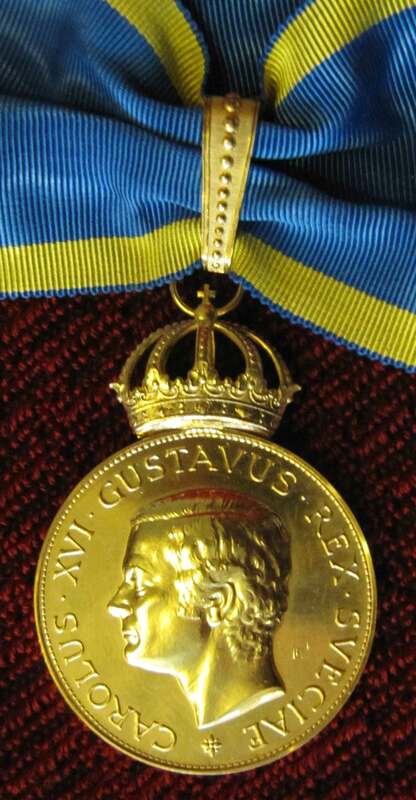 The Illis Quorum medal. Photo Credit: Richard Nyström. The award name translates to “For Those Whose Labors Have Deserved It.” First introduced in 1784 by King Gustav III, the Illis Quorum medal is the highest award any Swedish citizen can receive from the Swedish Government. The Foundation for Global Sports Development (GSD) announced today the names of the 18 athletes chosen to receive their 2014 Athletes in Excellence Award. This esteemed award was designed to honor competing and retired athletes who have been role models, leaders and champions not just in sports, but in their communities by selflessly giving back through mentorship and outreach activities. Awardee nominations were open to the public and accepted during the months of June through August. Following careful review of all nominations received, GSD’s board of directors, with the help of an advisory committee, selected a total of 18 athletes to receive the award. “The humanitarian efforts achieved by these impressive athletes are inspirational and deserving of the highest level of honor and recognition,” said GSD executive board member, David Ulich. “We are thrilled at the opportunity to give back to these athletes whose selfless activities embody all that GSD stands for,” added GSD executive board member, Dr. Steven Ungerleider. The inaugural group chosen to receive GSD’s first ever Athletes in Excellence Award will be presented with a certificate recognizing their achievement and a grant in the amount of $10,000. Jeb Brovsky, Professional soccer player and founder of the Peace Pandemic Corp., which helps provide equipment for young soccer players in impoverished countries. Nominated by Benoit Labonte of Jebi Knights. Candace Cable, Paralympian, advocate for people with disabilities, public speaker, former program director. Nominated by the U.S. Olympian and Paralympian Association. Emily Cook, Olympian, athlete ambassador for Right to Play, Classroom Champions, and Kids Play International. Nominated by teachers Andrea Wiggins and Valentyna Banner. Hannah Davis, Olympian, volunteer and student mentor. Nominated by David Foureur of Australian Canoeing. Tracy Evans, Olympian and founder of Kids Play International which uses sport as a catalyst to promote gender equality in communities impacted by genocide. Nominated by the U.S. Olympian and Paralympian Association. Rafer Johnson, Olympian and founder of the California Special Olympics who is involved with multiple community outreach and humanitarian projects. Nominated by Anita DeFrantz. Peter Karlsson, Olympian and Peace and Sport Program ambassador who is involved with the implementation of youth based table tennis programming in high-conflict areas including Columbia, East Timor, Burundi, and the Congo. Nominated by the International Table Tennis Federation (ITTF). Lao Khang, Member of Lao Women’s National Rugby Team, youth mentor and coach who leads rugby activities in rural, remote, and underserved communities. Nominated by Megan Knight. Angela Madsen, Paralympian, Ready, Set, Gold volunteer and founder of California Adaptive Rowing Program which provides instruction and training in the sport of rowing to physically and intellectually challenged individuals. Nominated by the Southern California Committee for the Olympic Games (SCCOG) Ready, Set, Gold Program administration. Steve Mesler, Olympian and co-founder of Classroom Champions, a youth mentoring program that connects top performing athletes with students in high-need schools. Nominated by the International Fair Play Committee (CIFP). Kieran Modra, Paralympian and mentor of visually impaired youth living in Australia. Nominated by Sylvia Modra. Tim Morehouse, Olympian, Right to Play athlete ambassador, youth mentor, and founder and CEO of Fencing in the Schools. Nominated by Jeff Spear. Zahra Nemati, Paralympian and humanitarian who advocates for equality and often speaks publicly on the issue to groups, including the UN. Nominated by the International Paralympic Committee (IPC). Tony Sanneh, Major league soccer player and founder of The Sanneh Foundation which uses soccer as a catalyst to empower kids, improve lives and unite communities. Nominated by the USOC’s Athletes’ Advisory Commission. Dallen Stanford, Professional rugby player, rugby coach, program manager for the youth nonprofit organization, Play Rugby USA, and ambassador for the Tackling Cancer Foundation. Nominated by Erin Sullivan. Robert Susanj, Curler, member of the European Curling Federation and director of the Police Administration Specialty who is involved with multiple community service efforts. Nominated by the World Curling Federation (WCF). Hayley Wickenheiser, Olympian, member of the IOC Athletes’ Commission, Classroom Champions volunteer, KidSport volunteer, and ambassador to impoverished African countries where she visits schools and communities to mentor youth. Nominated by Dale Ross, Principal at Shaunavon Public School. When we first launched our new Athletes in Excellence Award program in June, we were so pleased to share this award with our community. With this new program, we planned to spotlight outstanding athletes and recognize their work in community outreach. By awarding the recipients a grant of $10,000, we knew that even more positive change would come as the athletes were able to pursue their passions. The nominations began arriving, and we heard from organizations and individuals all over the world who were also eager to recognize athletes for achievements on and off the field. We enjoyed learning more about all of the nominees and seeing the wonderful effects of their work. It quickly became evident the selection of finalists would be a difficult task indeed, as so many of the nominees are deserving of recognition. For the Athletes in Excellence Award, we chose 18 individuals whose exceptional work we are excited to share with all of you. Please join us in congratulating our inaugural group of award recipients. Tony Sanneh, Major league soccer player and founder of The Sanneh Foundation which uses soccer as a catalyst to empower kids, improve lives and unite communities. Nominated by the USOC’s Athlete Advisory Commission. Funding worth $27,500 (£17,000/€22,000) has been donated to the Association of National Olympic Committees of Africa (ANOCA) by the Foundation for Global Sports Development in order to improve communication. Written by Nick Butler of Inside the Games – Read the original article here. The funding, provided as part of the Foundation’s partnership with the United States Olympic Committee (USOC), will be put towards 55 laptops distributed throughout ANOCA’s membership. This will allow improved internal communication as well as better support between National Olympic Committees, with the hope that this will improve efficiency and professionalism and, hopefully, facilitate better performances, in both an administrative and a sporting sense. It should also increase the abilities of ANOCA members to publicise their work, which would enhance opportunities to gain sponsorship and other commercial support, it is claimed. This marks a latest example of USOC helping to develop sport in Africa after equipment – consisting of sports shoes, jerseys, shorts and tracksuits – was donated to the Somone Olympic Africa Centre in Senegal earlier this year. The Foundation for Global Sports Development, meanwhile, has provided financial support and guidance to organisations using sport for wider development throughout the world for over two decades. The latest funding has been announced alongside various other projects, including a pledge of $375,000 (£234,000/€299,000) in grants to support charities focusing on improving the lives of young people through sports, educational, and health based programmes.